text Text to edit. The return value of this function should be assigned back to the string as shown in the example. maxLength The maximum length of the string. If left out, the user can type for ever and ever. style The style to use. If left out, the textField style from the current GUISkin is used. options An optional list of layout options that specify extra layouting properties. Any values passed in here will override settings defined by the style.&amp;lt;br&amp;gt; See Also: GUILayout.Width, GUILayout.Height, GUILayout.MinWidth, GUILayout.MaxWidth, GUILayout.MinHeight, GUILayout.MaxHeight, GUILayout.ExpandWidth, GUILayout.ExpandHeight. Make a multi-line text field where the user can edit a string. 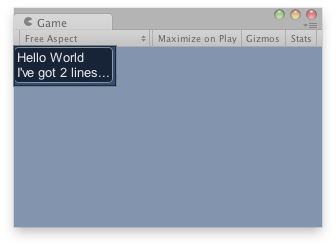 Text area in the Game View. // Make a multiline text area that modifies stringToEdit.